Chimnese Davids is South African, accounts clerk, bookkeeper and freelance writer. Her first publication was with an online magazine Allthings Girl in 2010.She had also been published in two anthologies, Step Into My Shoes published through Jafansta. Inc in June 2011 and Love In Creativity, published through Jingle and Gooseberry Garden Community in March 2012. She was 12 years old when she started writing and won a contest in 1996. Her debuted poetry and prose collection, “Muses of Wandering Passions” is her first book published. 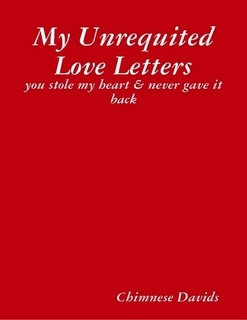 This is a book full of love letters written by Ms. Leonine to her lady love. It’s a simple book, but each letter is full of emotions and passion. Unreturned love letters. Sounds hard to keep in the heart, but to me, the book is like a diary. I can picture the lady love one day, sitting with Leonine and reading the letters. I wonder if that’s what the author might have pictured as well. The book is short, and there isn’t anything so deep that I need to break up and analyze. The plus point is the emotion that is in the love letter, and makes the love easy to understand and imagine. The minus point would be the grammar and editing which can be loads better. Easy to read, and quick to read as well. Review for the author, who sent me a pdf of the same.